A cloudy, juicy IPA with lots of tropical fruit flavor. One thing The Bronx isn't short on is toughness. It's strong work ethic and no-nonsense attitude are why we chose to brew our beer here. 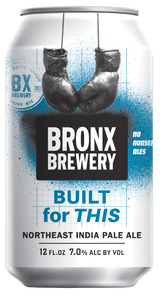 And in the spirit of the character of The Bronx, we created this tough-as-nails Northeast IPA. Full-bodied and hazy with tastes of orange, mango, and pineapple, it's a brew made big & bold like the borough that inspired it.